Olivia Fogel was able to realize her dream of paddling the Kazan River in Nunavut with her friend Katelyn Proulx in part due to the strong support she had at home from her partner Doug Weir. "If Doug had been unable to handle taking Sitka and Cedar to day care every day and then picking them up after a long, hard day at work, I'm not sure it would have happened," says Olivia. The two young dogs are high-energy Australian Shepherds. At just one and a half years of age they are a bundle of energy that needs to be worked off regardless of how tired their humans might be. Cedar, the more docile of the two, came to Olivia and Doug via a family placement, while the more rambunctious Sitka was a rescue. It was simple serendipity that the both have the same colouring and are so close in age. The young couple is relatively new to Huntsville. Olivia arrived here from the Almaguin area to work at the local Employment Centre while Doug has been commuting to his job at Sandhill Nursery as a rock designer for three years. It's a great way to utilize his creativity given that he studied art in B.C. for years. Their home is decorated with colourful, beautiful works that are very evocative of the First Nations images found in coastal British Columbia. "One day I'll get back to painting" he promises. "The work is so personal to me that it's hard to think about selling anything." Their relationship with their dogs is a sort of co-parenting, with each bringing certain strengths to the effort. Olivia laughs, "We talked about our approach to training all this past weekend!" Doug interjects, "I grew up with Jack Russel Terriers as pets so I bring one kind of experience to the training of the dogs whereas Olivia has lots of experience with working dogs. So, we really complement each other. The intelligence of the breed shows through with the amount of training they've been able to absorb at such a young age. Sitka is their 'guard' dog. They laugh, "She warns us of approaching squirrels, people, cars, a blowing leaf!" She is also becoming a very good Frisbee player. Given Olivia's background in sledding they had the dogs try pulling this past winter and were amazed at how well they did as puppies. It's not a regular Australian Shepherd's job but they seem to take to it. It wasn't easy to leave her job, partner and home to paddle the Kazan River but at least they had a chance to work up to it. A month long trip of this magnitude takes serious planning. Doug smiles, "Olivia was dehydrating food every night for months!" It can also cost upward of$10,000 to $12,000 dollars for two people to do this trip with an experienced guide but given that Katelyn had a canoe nearby, they had maps and experience on their side and made most of their food, they did it for a fraction of that. "Katelyn and I dreamed of a trip like this ever since we became friends working at a YMCA Camp leading whitewater expeditions. 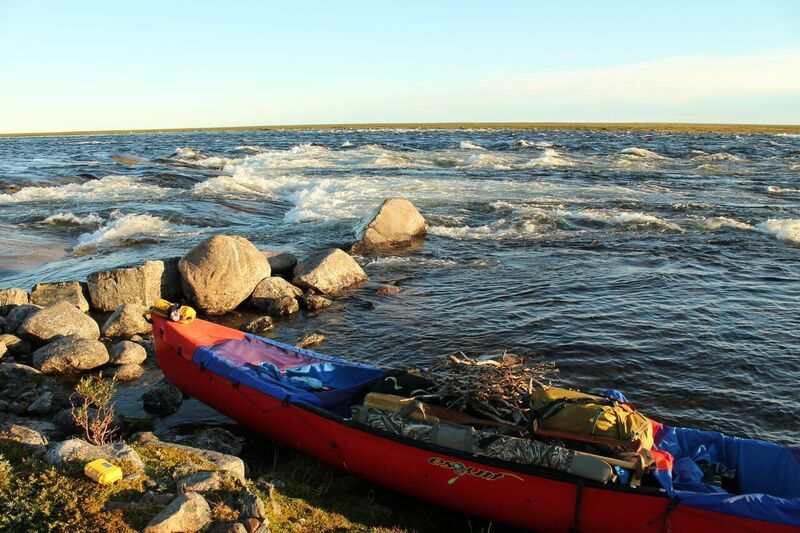 As our skills increased we knew that the natural progression would be paddling an Arctic River." Katelyn had been living and teaching in Nunavut for four years. Someone gave her a canoe that could handle the trip and neither of them could resist. The Kazan is a heritage river. The Canadian Heritage Rivers System (CHRS) was established in 1984 by the federal, provincial and territorial governments to conserve and protect the best examples of Canada's river heritage. It is a cooperative program of the governments of Canada, nine provinces, and the three territories to give them national recognition while encouraging the public to enjoy and appreciate them. .
"The Kazan is known for the landscape, the whitewater, fishing and the wildlife. We chose it for those attributes," Olivia explains. The 28 year old laughs, "I do have a 30 before 30 list of things I want to accomplish and while the river trip is on it, but it wasn't the reason I did it." She adds, "We are fairly sure that we are the only female twosome to undertake it on their own." She explains, "You have to portage around the Kazan Falls, which is the significant feature of the river. There is a well-known cache there with an ammunition box holding log books dating way back. We flipped through the journals as far back as 1974 and there were few duos at all and no women pairs that had written in the books." Access to the river is fly-in only. Olivia flew into Kasba Lake Fishing Lodge from Winnipeg, where the canoe and containers of food, equipment and other supplies had been shipped a month earlier. She and Katelyn arrived on June 29th and they paddled from July 2nd to August 1st averaging about 40 kilometres a day. In whitewater that's is relatively easy but paddling on flat water it's a challenge. Olivia jokes, "The trip is made up of a skinny river and huge lakes! Some lakes took three or four days to paddle across." She adds, "This was a windy year too. Out of 31 days we had three that were calm. It makes such a difference." It made a difference to Doug too. Back at home he was able to track the paddlers thanks to their SPOT device. SPOT is a GPS tracking device that uses the Globalstar satellite network to provide text messaging and GPS tracking. It allows the user to compose a custom message in real time using a smartphone. When he saw that the women were crossing a big lake he had trouble sleeping. He says, "That's when I really worried. And then when I didn't hear anything for a couple of days I got really worried." "At one lake crossing things had been going smoothly and we were pretty laid back," Olivia explains. "Actually, we let our guard down and it was one of the times I was truly afraid." She recounts, "The wind had been with us and in an instant it turned into a powerful headwind. We paddled for an hour with our shoulders burning with the effort and we hadn't made any headway. All I could think about was that if we were swamped or blown way off course or separated we'd lose time that we might never make up." They regained control as the wind abated and they re-learned a lesson they'd long known - expect the unexpected and stay sharp! "Katelyn and I had different strengths at different times. We both did well in whitewater but there were times when she had to lift me up. She was more familiar with the Arctic and sometimes I just got homesick. She really became the guide due to her familiarity with the landscape." She adds, "I can't imagine having done this with anyone else." The trip only had about six portages; three were mandatory because of waterfalls. "It was often like walking in knee deep snow when portaging through deep mossy areas." She expounds, "With only three hours of darkness a day and often needing a break in the middle of the 40 kilometres we'd set as a goal, we played around with our paddling times. We'd paddle from 5 a.m. to 1 p.m. and then sleep and paddle from 9 p.m to midnight. But we got sick of setting up camp twice a day so we moved to a 2 a.m. to 2 p.m. paddling schedule." She says laughingly, "Along the Kazan everything is a campsite and nothing is a campsite." With nothing designated, they chose a different pretty and/or convenient spot every day. The landscape was breathtaking. "We started at the edge of a boreal forest and ended at full-on tundra. There was Labrador tea all over the ground and that and so many berries - cloudberries, cranberries, blueberries - all were edible. Fishing was abundant so we ate a lot of fish. Some were so big they lasted us for three days." They saw grizzly bears, musk ox, a few caribou, lots of eagles, terns and arctic swans. Olivia notes, "Even the seagulls were special! it was nice to see them fishing in their natural habitat instead of scrounging for garbage or fast food!" The last 40 kilometres was the most beautiful according to Olivia. Doug jokes, "Maybe it was just because it was the end!" Olivia describes the last day: "It was all whitewater and we travelled about 10 kilometres an hour." She recants slightly....well, it was 'swifty' water all the way if not actual whitewater for the whole 40 kilometres. We travelled through these gorgeous eroded red cliffs of sand and rock. The water was high and it felt like we were flying!" Back on terra firma, she makes an number of observations: "I don't consider myself super fit. I certainly don't go to a gym. I'm fit enough given my outdoor lifestyle but in many ways doing something like this requires even more mental than physical strength. It's about managing the hazards, dealing with the cold, fixing things that broke and being prepared to use our rifle to defend ourselves from grizzlies if it came to that. Will she do it again? Absolutely...but maybe not for awhile. But this weekend is for family time. Olivia and Doug and their dogs are going to Massasauga Provincial Park to camp and do some flat water canoeing. It will be the first time that they have all gone camping together. Like all loving dog owners, they can't wait to see how the doggies do in an activity that 'mom and dad' enjoy so much and that they will be able to do together for years to come.